FILE - American Shi'ite Muslims march to the White House to protest against the Islamic State group, in Washington, D.C., Dec. 6, 2015. Sarwat Husain admits the hijab she wears sometimes draws inquiring glances in her home state of Texas. But on a flight to Orlando, Florida, the man sitting next to her gave her more attention than she was used to. 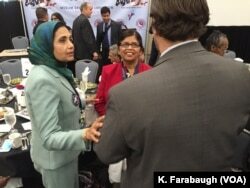 Sarwat Husain (left, in a green jacket) at the AMDC Luncheon at the Pennsylvania Convention Center during the Democratic National Convention. What her seatmate did not know was Husain was on her way to Orlando to take part in the Democratic Platform Committee, the group seeking to set the agenda for the Democratic Party ahead of the Democratic National Convention in Philadelphia. She’s the founding President of the San Antonio chapter of the Council on American Islamic Relations (CAIR) and is also one of the founders of the American Muslim Democratic Caucus (AMDC), a grass roots political organization, and she’s been getting more involved with the Democratic Party to help provide better representation for Muslim Americans across the country. 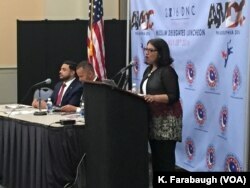 The AMDC formed in the years after the 2001 9-11 terror attacks to respond to the hate and bigotry directed at the Islamic community and encourage more Muslim Americans to engage in the political process in the United States. “The fear factor was so high then,” she says. But her recent flight to Orlando reminded her the fear factor remains high, and there is still an urgency for Muslim Americans to get more involved, more visible, and more present in politics to counter rising Islamophobia. FILE - Imam Azhar Subedar, left, speaks during a special interfaith prayer service at the American Muslim Community Center in Longwood, Florida, June 13, 2016, to support the Orlando shooting victims. Delegates at the AMDC Luncheon at the Pennsylvania Convention Center during the Democratic National Convention. The delegates met only hours before the party nominee, Hillary Clinton, would embark on a campaign against Republican Donald Trump, whose comments already are unsettling to many Muslims. In this setting, delegates are focused on participation. She admits there are some who don’t share her vision. “There are also some people who think having a Muslim will hurt the party,” but she also points to the recent elections of Congressman Keith Ellison in Minnesota and Congressman Andre Carson in Indiana, both Muslim Americans, as a sign those beliefs are shifting. 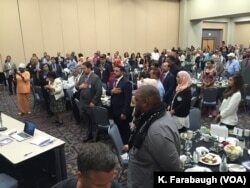 Another obstacle standing in the way of increased Muslim American engagement in politics is getting members of the community registered, energized, and eager to vote. FILE - U.S. Rep. Keith Ellison (D-MN) (R) speaks during a news conference. The Pew Research Center estimates there are 3.3 million Muslims living in the United States, currently representing about one percent of the total population. That number is expected to double by 2050. Muslims are one of the fastest growing communities in the United States. But many Muslim Americans who can vote, don’t. “It’s not the fault of the American government,” says Tahir Ali with the American Muslim Alliance. He says several reasons include previous voting experience. Which, Ali says, is why many Muslim American immigrants who gained their U.S. citizenship and are eligible to vote, skip the ballot on election day. Sarwat Husain says sometimes voting just isn’t a top priority for immigrants. “Many of the immigrants, they are still trying to settle down, their roots, you know take care of the family, raise their children, because this is an extremely family oriented society,” which she says is why the emphasis on voting is often transferred to the next, younger generation of eligible voters, like Noman Khanani. FILE - A Muslim woman holds a poster during a protest against Donald Trump in New York, Dec. 20, 2015. A six-state poll conducted by the Council on American Islamic Relations (CAIR) in March, during the “Super Tuesday” primary election, showed that almost half (46 percent) of those polled supported Democratic candidate Hillary Clinton. About 11 percent supported Republican candidate Donald Trump. What the poll also revealed was that older Muslim Americans tended to support Hillary Clinton while younger Muslim American voters supported Vermont Senator Bernie Sanders. Noman Khanani was one of them. How many younger Muslim American Bernie Sanders supporters will now support Hillary Clinton remains to be seen, but one thing that could help her in November is motivating older Muslim Americans, who tend to support her, to get out to the polls on election night. A delegate addresses the AMDC Luncheon at the Pennsylvania Convention Center during the Democratic National Convention. As Sarwat Husain looks around the packed room for the AMDC luncheon, she notes the many young faces in the crowd, many of them first time delegates like Noman Khanani, brought into the political fold by Sanders. But she’s looking beyond the November election, hoping that the next Muslim American Congressional candidate may be someone sitting in the room. But every candidate needs support, and in a close election, every vote counts. Husain says aside from the appeal of a candidate, connecting to Muslim Americans on a religious level may also boost overall Muslim American voter participation. Several years ago, Husain’s encounter with the man on the airplane would have unsettled her. Now, thanks to time and experience, she knows how to handle it. And, she says, the more urgency to have Muslim Americans representing one of the fastest growing communities in the United States.